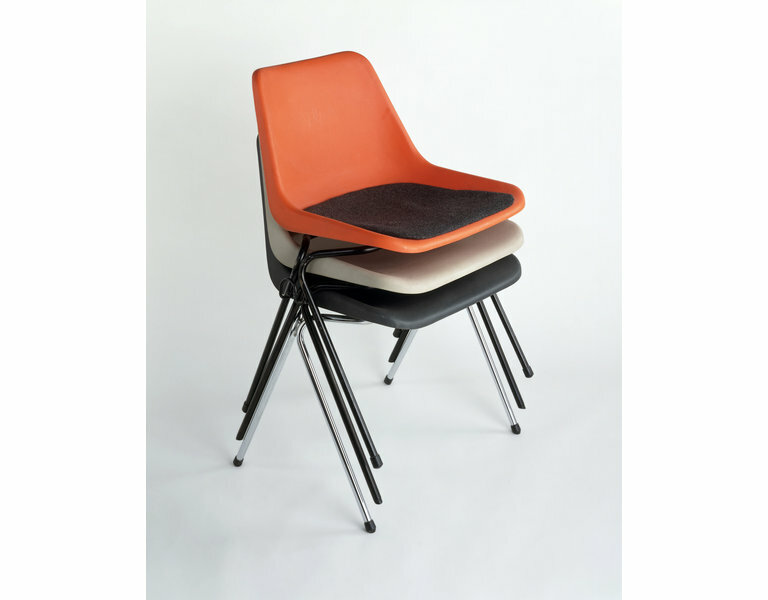 Robin Day's stacking chair, popularly known as the Polyprop chair, was one of the most commercially successful British furniture designs of the 1960s. The name refers to Polypropylene, the revolutionary new material invented by the Italian chemist Giulio Natta in 1954 (he won the Nobel Prize for Chemistry in 1963). The chief virtues of the new plastic were its lightness, flexibility, inertness and above all the ease with which it could be injection moulded. By the end of the 1950s Shell was manufacturing the material and promoting its use through design competitions. Robin Day was invited to judge one such competition and realised he had discovered a perfect material for mass-produced furniture. Since the Eames's and Saarinen had experimented with making one-piece chairs in the USA in the early 1950s, glass fibre had been the most suitable material, but was very expensive. Polypropylene cost much less, even though considerable investment was required for the tooling. A single tool for this chair could make 4000 shells per week, at the rate of one and a half minutes per shell, making each unit very cheap. These shells were attached to tubular steel stackable frames. 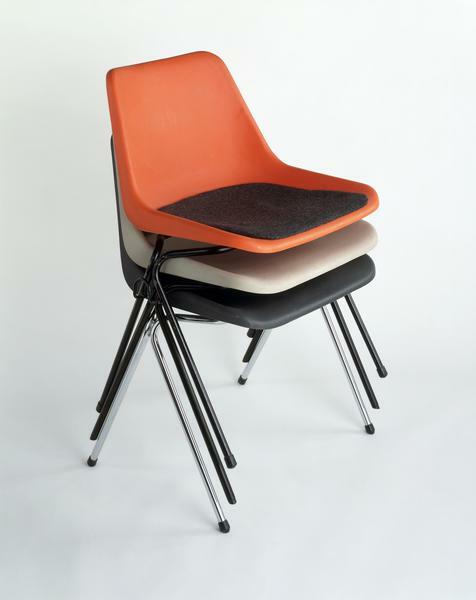 Hille, the manufacturer of Robin Day's chair, bravely agreed to invest in a new mould after the first versions were found lacking, leading to the official name of the chair as the Mark II. From its introduction in 1963 it has been unaltered and became almost as ubiquitous as Michael Thonet's bentwood chairs had been a century earlier. Stacking chair, polypropylene shell moulded in one piece with metal base (made of enamelled blockstore, black nylon or bright chrome tube). Robin Day's commitment to technology transformed Hille's fortunes from a maker of reproductions to a major force in international contract furniture. Polypropylene was invented in 1954 by Italian Nobel Prize winner Guilio Natta and seemed the perfect material for mass-producing low-cost, durable seating. By the end of the 1950s the petro-chemical company Shell were producing it in various formulations and Robin Day judged a competition staged by Shell to promote Polypropylene to designers. The dies to make the chair were expensive, but each chair took less than two minutes to mould and could be mounted on an infinite variety of bases. Mark II, launched in 1963, sold millions world-wide by the end of the decade. Polypropylene is a more malleable material than wood, which allowed the form of this chair to develop from the organic shapes of moulded plywood and glass-fibre furniture. 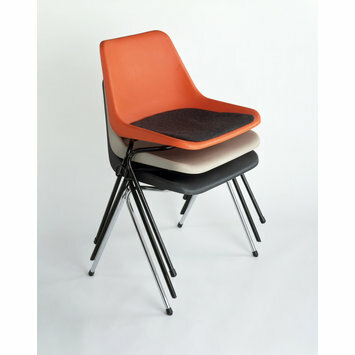 'Mark II' chair, polypropylene on a metal base, designed by Robin Day, manufactured by S. Hillie & Co. Ltd., from 1963. Hille - 75 years of British Furniture. Sutherland Lyall. Elton Press Ltd. pp45-51. Design since 1945. Philadelphia Museum of Art. 1983.